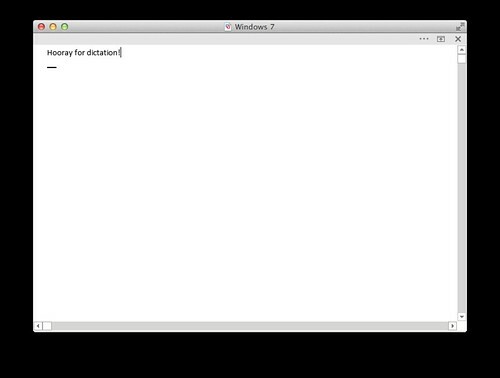 As I discussed in my previous post, I do my serious dictation in a Windows 7 virtual machine. Having recently upgraded my dictation setup and transferred it to a new Mac, I figured it'd be a good thing to share. While I don't have any experience with its competitors, VMware Fusion 6 does a good job of making my USB headset plugged into OS X available to Windows for dictation, without interfering with its use in OS X. Dragon NaturallySpeaking calls VMware's audio source “Microphone (Mic-In).” In earlier versions of VMware Fusion, I had mapped my USB headset exclusively to Windows for dictation. This also worked well, but I'm not sure if it was actually necessary. Most of the time I'm not actually editing documents directly on Windows; the OS simply holds my text on the way to its destination in a Mac application. Dragon NaturallySpeaking (and its Medical derivatives) include a WordPad knockoff called DragonPad. Its stated purpose is exactly as such a dictation intermediary, but the user interface looks like it was frozen around Windows 2000 and it only supports single undo — not even redo. So, it's a bit of a nonstarter. My next best bet is Microsoft Word, for which NaturallySpeaking includes a COM-based addin. Previously, NaturallySpeaking 10 limited me to using the 32-bit version of Office 2010; with version 12, I can use 64-bit Office 2013. Use VMware Fusion's "Single Window" view, rather than its Unity view. The Word view options I describe only work if the Word window is maximized. In Unity view this means maximizing to the Mac’s screen, whereas in the Single Window view, you can resize the VM screen as needed. It's nice to be able to see your other Mac apps as you dictate (or not; I use Shroud’s keyboard shortcuts to alternatively hide everything else but the VM window when I really need to focus). Set the Windows taskbar to auto-hide. Turn off Word’s Start screen so you get an untitled document when you start Word. Switch Word to draft view, via Alt, W, E or clicking the Draft button in the View ribbon tab. Those of you who have been using Word since 4.0 or earlier may remember this used to be the default view, but it’s been marginalized in favor of more WYSIWYG alternatives in recent Word versions. However, this heritage explains the corresponding dictation command, “normal view”. (If you accidentally say “draft view”, you’ll probably find everything changes into Courier; say “turn off draft mode” to fix that.) The main advantage of draft view is that you can resize the window without changing your font size; it's also more space efficient, as it doesn’t display your margins. Outline view (Alt, W, U, or say “outline view”) is also a good choice for dictation. though Word is no OmniOutliner. Say “new line” rather than “new paragraph” or you’ll dictate a bunch of empty headings. “Tab” and “press shift-tab” will indent and unindent respectively. Set Word's ribbon to auto-hide, via the button between the help and minimize buttons at the top right of the window. This maximizes the window if it isn’t already; it also hides the status bar, window title bar and most other chrome. A long button across the top of the window labeled with an ellipsis will restore the chrome if you need it, as will a press of the Alt key. Experiment with Office themes (Options > General > Personalize your copy of Microsoft Office). The White theme is more trendy but I prefer a bit more separation between content and chrome, so I picked Dark Gray. Consider disabling the cursor animations (smooth movement of the insertion point as you type) if they're as disconcerting to you as me. Once you have your view set up, you'll find that Word reverts to Print Layout view for new documents. Unfortunately, to solve this problem you must delve into the crufty world of Office automation with Visual Basic for Applications. From the look of its toolbars, the VBA editor last had serious work done in the Office 2003 timeframe; most of it appears unchanged since VBA’s inception.
' Wait until a document opens.
' Draft view is wdNormalView.
' If window isn't maximized, ribbon doesn't collapse fully. Update: I have posted an updated version of the above macros to GitHub. A related note: I experimented with Windows Live Writer for this post, versus my usual process of copying and pasting into MarsEdit. As long as I turn off the “Blog Theme” button (which causes problems unrelated to dictation), dictation into Windows Live Writer works acceptably. The biggest issue is the markup ending up all one line in WordPress, despite looking fine (seriously — a Microsoft tool that generates tolerable markup!) in Windows Live Writer. Smaller issues include the results box appearing in the top left corner of the screen regardless of my cursor location (normally it appears at the insertion point) and dictation inserting unnecessary newlines, particularly in a bulleted list. I dictate to my computer a lot. It helps me write faster and saves my hands for other pursuits. In the last few years, dictation, both of the local and network-hosted variety, has improved to the point that this choice is no longer an infuriating time sink. Coding, versus writing prose, via dictation is still in its infancy and I continue to anxiously await Tavis Rudd’s release of the dictation system he demoed at several conferences last year (warning: videos may be NSFW thanks to some synthesized expletives). In a conversation on Twitter earlier this week I noted that, despite considerable enhancements in the past few years, dictation on OS X doesn’t get discussed much — hence this post. If you’re going to be playing with dictation, make sure you have a decent headset, properly positioned. Wired, noise-canceling USB headsets are not expensive, and even though Apple’s been adding microphones and improving noise canceling on their Macs recently, you still do better with a headset. If the dictation system you’re using doesn’t include an audio setup step, just record and play back some of your own speech to make sure it’s audible and relatively free of background noise. Networked dictation was introduced in OS X 10.8 Mountain Lion. It’s similar to the dictation service on iOS, and benefits from its use by Siri. I appreciate its well executed incorporation into the OS: you can dictate effectively into nearly every text field everywhere; you can easily start and stop dictation from the keyboard; dictation alternatives (blue dotted underline) are part of the Cocoa text system, and dictated text nicely integrates its capitalization and sentence structure with the surrounding material. The software on the other end of the network has a huge vocabulary, including medical terms. no error handling whatsoever. If the server fails to respond or recognize your words, up to a minute of spoken text is lost. This is somewhat understandable on iOS, but given the essentially infinite resources of OS X in comparison, it’s not defensible there. Ideally, I’d expect audio to be saved as a text attachment for deferred recognition, much like the Newton did with ink text. There are also privacy issues, of course. I’m careful not to use this service to dictate anything sensitive, regardless of the promised or actual handling of my data. OS X Mavericks (10.9) introduces “Enhanced Dictation”, a locally hosted version of Nuance’s recognizer. It’s not installed and off by default; you can turn it on in System Preferences. Like OS X’s networked dictation, Enhanced Dictation is not trainable and doesn’t let you edit by voice, but it does let you mix keyboard/mouse editing and dictation. While it does provide the feedback expected of a local recognizer and does away with the one minute dictation limitation, it’s the only one of these options I find unusable in practice. Enhanced Dictation’s omissions of training and editing likely protect sales of the Dragon Mac products (discussed below). The bigger issue is that this seems fundamentally a speaker-dependent system without a method of training, resulting in frequent dictation errors you can’t fix. The vocabulary seems smaller than the networked alternative, though because of its frustratingly high error rate, I haven’t done a lot of testing. It also uses a lot of memory. Nuance offers Dragon Dictate for Mac, MacSpeech Scribe and Dragon Dictate Medical. The Mac-specific components of these products and their predecessors have always been buggy and flaky. My experience with the support and sales surrounding them have ranged from incompetence to sleaziness. I have purchased several versions and upgrades of these products going back to the original pre-OS X, Philips recognizer-based versions, but I’m not going to keep supporting software that is this poorly developed, sold and supported. The main reason I dictate into Windows is the ecosystem surrounding the Dragon products there. There are quite a few abandoned research projects and other near-abandonware to contend with, but it’s possible with some effort to construct a productive system. What I’ve done thus far is nowhere near what Tavis Rudd did, but it works for me. Natlink is a Python framework for building recognition systems, with several macro languages/frameworks built on top including Unimacro, Vocola and Dragonfly (the basis of Tavis’s system). Microsoft also bundles speech recognition with Windows these days; I’ve used it very little, but it does work with Dragonfly. I use OS X’s networked dictation for brief passages, and a Windows 7 VM for anything longer, like this post. I recently upgraded my Windows environment to the current Dragon Medical 2 (equivalent to NaturallySpeaking 12) and Word 2013. More on that setup is coming in my next post.